You are an Archon. Renowned and respected across the diverse artificial planet of the Crucible, you are nonetheless cursed with ignorance of your own existence. The Architects have harvested countless worlds to supply your world, bringing creatures, artifacts, and sometimes entire cultures across the stars to form their unique wonderland. With no obvious means to return home, many of those brought to the Crucible look to you for guidance and leadership, but how can you lead others when your own path is a mystery? The key to discovering the secrets of your origin and the knowledge of the Crucible is hidden within countless Vaults, scattered throughout the planet. If you gain entry to these Vaults, you will absorb their full wisdom and strength, but you are not the only one who seeks this power. Rival Archons seek this same knowledge, and they are not likely to walk away without a fight. When your clashes begin, you must draw upon the power of your team, relying on their unique skills to stave off your enemy as you gather enough Æmber to forge three keys and open the Vault. 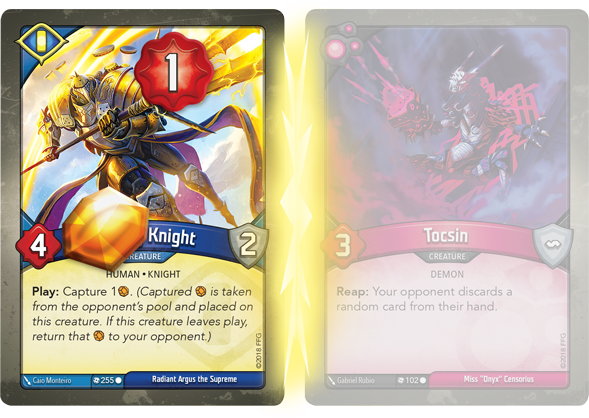 Today, we offer you a closer look at these chaotic clashes as we examine the gameplay found in KeyForge: Call of the Archons, the world's first Unique Deck Game! 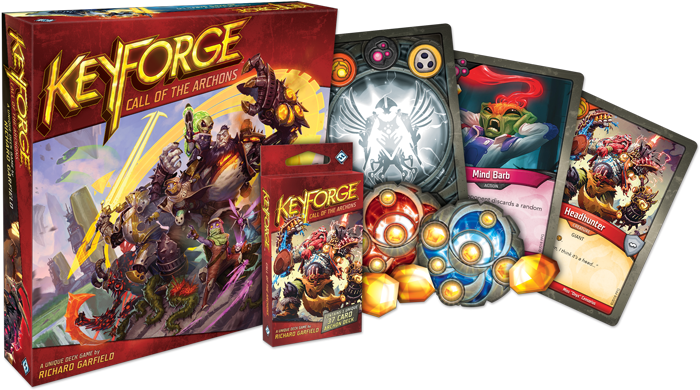 Games of KeyForge are fast-paced and deeply tactical, challenging you to make the most of the options available to you at any given turn. Each turn consists of five steps: forge a key; choose a House; play, discard, and use cards of the chosen House; ready cards; and lastly, draw cards. As the first step you take on each turn, you must forge a key if you have enough Æmber in your pool. The race is on to forge the three keys needed to unlock the contested Vault—you cannot risk any delay! However, this forging takes its toll, and you can only forge a single key during this step each turn, no matter how much Æmber you have stored. At the start of your turn, you can immediately forge six Æmber into a key! After you have the chance to forge a key, you must choose which of the three Houses in your deck to declare for the turn. When choosing your active House, you must carefully consider your current priorities with the cards in your hand and those on the field as when you declare an active House, you can play, use, and discard cards from that House and only that House. You must hold on to any cards from the other two Houses in your deck until your next turn! While declaring a House each turn creates a new puzzle to test your judgement, the unique gameplay of KeyForge does not end there. Traditional card game "economy" does not exist in KeyForge: Call of the Archons— there are no card costs on any card. In fact, many cards give you Æmber simply for playing them, bringing you closer to victory before the fight has even begun! You are free to play as many cards as you like from the active House, but you must also remember that creatures and artifacts enter play exhausted, and you will not be able to use them until the next time you activate that House. 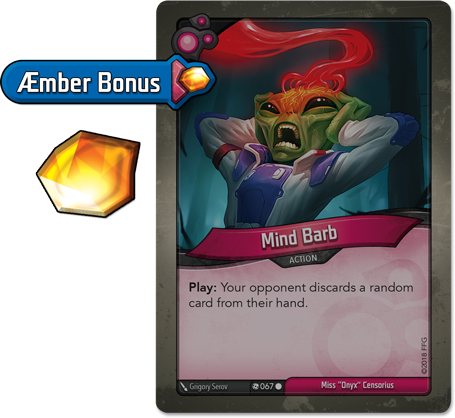 Many actions and other cards reward you with Æmber just for playing them! Choosing a House is just the start of the scintillating questions that challenge your tactical prowess. Will the challenges on the field remain the same in the next round? Will the cards from one House work best if cards from another House are already on the field? What order must you play your cards in to create the most powerful combinations? Through exploration and experimentation you can discover how the cards of your deck interact to form a truly unique deck that is yours alone to master. If creatures from your active House are on are on the field and ready, then they are yours to command as you reap, fight, or use their own unique action detailed on their card. Exhausting a creature to reap simply earns your Archon an Æmber for their pool, while fighting lets your creature select a target on the enemy battleline to attack. When two creatures meet in combat, they match strength against strength, with both the attacker and defender dealing and receiving damage. 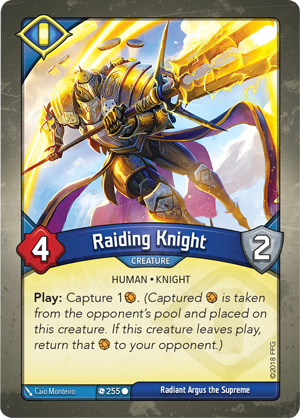 But while the promised thrill of a fight is appealing, you must keep in mind that in KeyForge, your goal is not to win the battle. Clashes between creatures are merely the means to an end. By defeating enemies, you leave your opponent with fewer creatures to reap Æmber, thus slowing their progress in the race to forge three keys. You must balance your collection of Æmber and your military engagements as turns fly by and characters on both sides of the field enter and leave play in a blink of an eye. In KeyForge, you will have an assortment of creatures in play, ready to reap or fight at your command! Still, there are ways to control Æmber collection even in the heat of battle. Some creatures can steal the precious substance for your own pool, while others, like the Raiding Knight (Call of the Archons, 255) can capture your enemy’s Æmber and hold it for themselves. When this happens, the only way for your rival to retrieve their Æmber is to destroy the creature holding it or force them to leave play. Until then, your rival Archon cannot use the captured Æmber to forge keys. For example, the Archon known as Radiant Argus the Supreme has chosen Sanctum as his active House and sent his Raiding Knight to battle against the forces of Miss “Onyx” Censorius. Raiding Knight has a power of four while his chosen target, Tocsin (Call of the Archons, 102), has a power of three. When they clash, Raiding Knight deals four damage to Tocsin, who simultaneously attempts to deal three damage to Raiding Knight. However, two of Tocin's damage are prevented by Raiding Knight’s armor. Thus, Tocsin is destroyed while Raiding Knight suffers one damage and lives to fight another round, hoarding the Æmber and keeping Miss “Onyx” Censorius from recovering it. 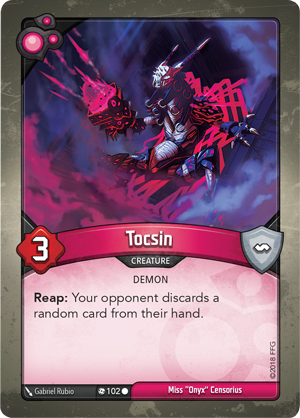 Tocsin is destroyed in the clash while Raiding Knight only takes one damage! Once you have made the most of all the possiblities with your active House for the turn, all of your cards ready and you draw back up to six cards at the end of your turn. Hopefully, you've set yourself in a favorable position, declaring “Check!” to warn your opponent (and maybe boast a little) if you have the six Æmber in your pool needed to forge a key at the start of your next turn. Thus, the competition continues until you or your opponent have forged three keys and open the Vault. Are you ready to take on the challenge of the Crucible and battle your fellow Archons? With the entire knowledge and power of the planet on the line, your opponent is not likely to show mercy. The Crucible is waiting for you; and with billions upon billions of unique decks, you still only need one to play. The time has come to ready your team, lead the attack, and answer the Call of the Archons! Look for KeyForge when it arrives in the fourth quarter of 2018! 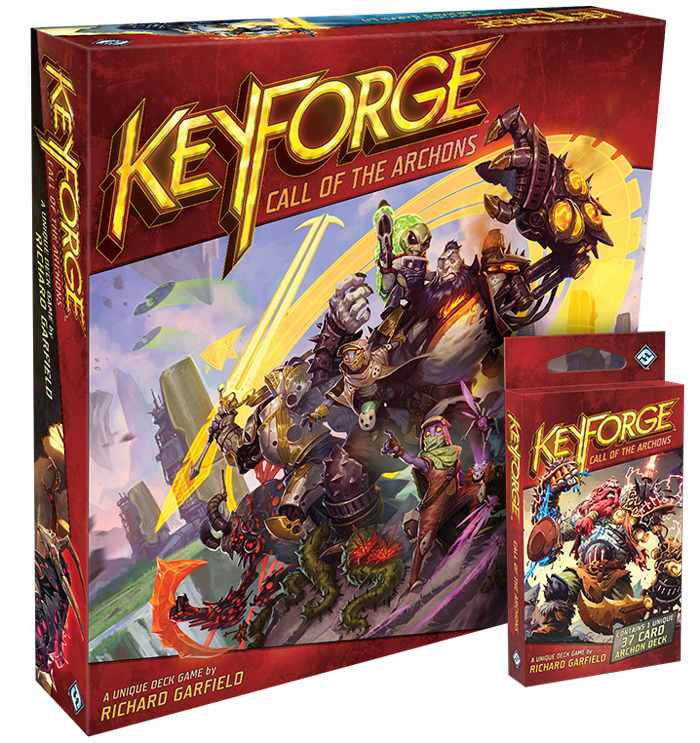 Or, to be sure your rivals don't leave you in the dust, you can pre-order your copy of the KeyForge: Call of the Archons Starter Set (KF01) and your collection of Archon Decks (KF02a) at your local retailer today or on the Fantasy Flight Games website here!